Broccoli is a lovable but rambunctious dog who wants to find a home in this fetchingly fun picture book! Broccoli lives at Beezley’s Animal Shelter and loves to show off his bowl-tossing and tail-chasing skills—and especially his great big BARK! He dreams of playing in a yard with a boy. But when a boy named Oscar comes looking for his perfect pet, Broccoli is hidden away. Will Broccoli find his perfect home? 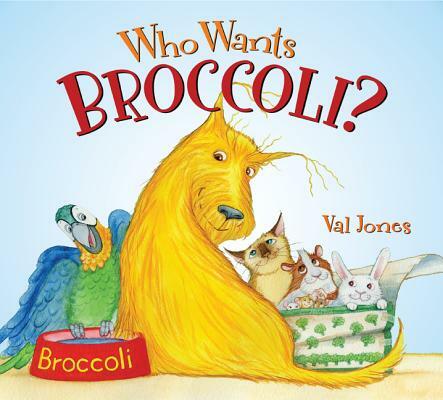 Val Jones was inspired to write Broccoli's story by her adopted Labradoodle, Fergus, whose foibles were a sure deterrent from being picked as a perfect pet by some, but not by her. Val studied art at Hussian School of Art in Philadelphia, and after freelancing as an illustrator, followed by a career in the corporate world, Val was finally free to pursue her dream of writing and illustrating picture books. Val lives in Pennsylvania with her husband, Bob, their dog, Fergus, and Pity the kitty. Broccoli’s over-the-top behaviors are likely to elicit giggles, and Mrs. Beezley’s message that “there’s a lid for every pot and a pot for every lid” could promote discussions around pet ownership, acceptance, family, and friendship.